WeBind’s 1-month Digital Marketing Course is an exclusive hybrid program curated by leading marketing strategists with a cumulative experience of 50+ years. The hybrid model gives the learners, an opportunity to invest proportionate time in classroom hands-on learning, as well as online interactive learning and 1 to 1 personalized experience with the expert trainers. The course starts Digital Marketing from the basics and progressively skilling the participant enough to run a complete campaign on her/his own. The modules have been systematically assembled so as to form a storyboard pattern and equip learners with the day-to-day working of a Digital Marketing agency or team. 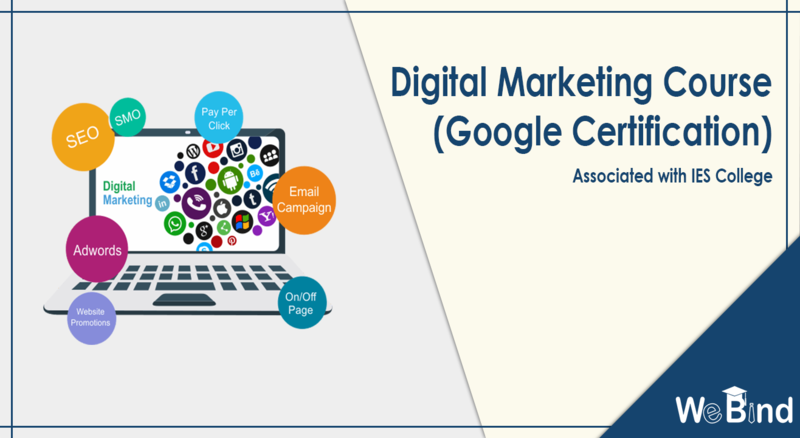 This program will make the learners get armed with Digital Marketing as a life skill besides offering a holistic 360 degrees super specialization perspective. Business owners and founders have the added advantage of an exclusive ‘Business Consultancy’ session devising growth strategies. While students and professionals can avail the ‘Career Consultancy’ by our experts to get assistance in the career with the advantage of 3 Google certificates.16 Modules, 3 Google Certifications, 4 Expert Trainers, 8 Case Studies, 6 Live Projects, 8 Softwares/Tools hands on Training with rigorous practice, 2 hours of Business or Career consultancy for each participant. Batch Starts: February 10 + Weekly online Live interactive sessions with the trainers. How to make money online being a part/full time freelancer Affiliate Marketing & Google Adsense. How to grow your E-commerce business using Digital Marketing.